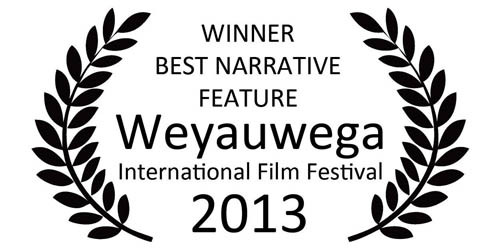 We’re excited to announce that Mourning Has Broken recently won for BEST NARRATIVE FEATURE at the Weyauwega International Film Festival in Wisconsin (USA). Coupled with Robert Nolan winning for BEST LEAD ACTOR at the Laughlin International Film Festival, it’s been a great month for Mourning Has Broken. Let’s hope we can keep it going into the new year! We’re delighted to announce that Mourning Has Broken will be the Opening Night feature at the Weyauwega International Film Festival in Wisconsin (USA). The screening is on November 14, 9:00pm at the beautiful George Gerold Opera House. For ticket information please visit the WIFF site. As part of the Grand River Film Festival screening of Mourning Has Broken, filmmakers Brett and Jason Butler were asked to participate in the Cinemerge Program running in conjunction with GRFF. Hosted by Gayle O’Brien, the Butler Brothers along with lead actor Robert Nolan, Graham Kent and Jane Pokou participated in a full panel discussion about independent filmmaking from both a production and artist standpoint. Also included was a very enjoyable Q&A after the screening with some insightful and thought provoking questions from the audience. All in all, a great time at a great festival – look for even more exciting things from GRFF in the years to come!